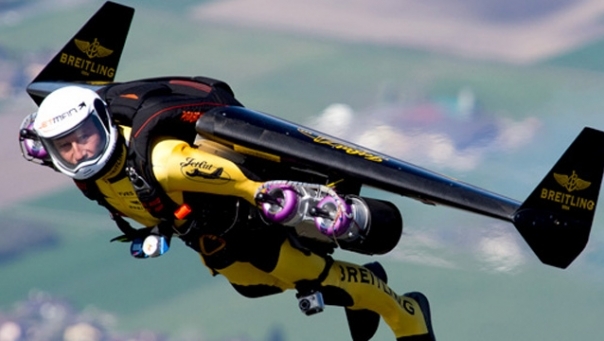 Swiss aviator Yves Rossy is The Jetman. Next week, he'll fly through the Grand Canyon. Swiss aviator Yves Rossy has chosen the Grand Canyon, one of the New7Wonders of Nature Finalists, as the location of his first US flight using jet-powered wings that are attached to his back. The “JetMan”, who is famous for his successful flights across Lake Geneva and the English Channel, will make his historic US flight on Friday, 6 May at 10 a.m.
Because of his passion for birds, and given the significance of the Golden Eagle and the Bald Eagle to the Hualapai people, whose traditional territory is a 100-mile (160km) stretch along the southern side of the Grand Canyon, Rossy began to think about flying through the iconic American site. After seeing the natural rock formation depicting an eagle at Grand Canyon West’s “Eagle Point” (home of the Skywalk), Rossy made up his mind to do it. The depth of the chasm at Grand Canyon West will allow the “JetMan” to fly past observers at nearly eye level along the sides of the canyon, a perspective that has never been witnessed before.